Personalized license plates proclaim our affection for Martha’s Vineyard, on roadways near and far. You’re driving to Menemsha. The blue Camry in front of you has an Ohio license plate that reads VINYRDR. The beach parking lot is almost full. While looking for an empty space, you notice a snappy convertible from Massachusetts with a CHILMK plate parked next to a red SUV from Connecticut sporting an OTBNMV plate. On your way home, you find yourself driving behind a red Jeep. Something catches your eye. It’s the letters FLYMVY. Your own license plate, a random sampling of letters and numbers, suddenly seems woefully deficient. If you’ve spent time here, you’ve seen them too. Spotting cars with Vineyard-inspired license plates has become as much a part of the overall Vineyard experience as seeing a T-shirt emblazoned with a black dog or a certain Menemsha bluefish. Yet among some locals, Vineyardy license plates don’t generate a lot of respect. “Who would get one of those?” scoffed a friend of mine. “No one that lives here,” commented her husband. I’m refraining from naming names in order to protect them from any embarrassment, because it turns out that the people who get these plates are people like Bill O’Leary, whose ties to the Vineyard go so far back that he graduated from the Tisbury High School. (For the record, Tisbury hasn’t had a high school since 1959.) Now living in South Carolina, Bill’s license plate reads MVISLND. In an e-mail, he wrote, “My license plate is intended to keep me closer to my roots.” He added that many of his friends also pay tribute on their license plates to the Island where they grew up. To find out more about who are behind the wheels of all these cars with Vineyard-themed personalized, or vanity, plates, I started leaving notes on cars last summer. The Vineyard Gazette ran a large ad. Calls came flooding in. I was, I admit, overwhelmed, and due to space limitations in this magazine and organizational limitations of my own, we could only profile a small number of the people who responded. This is unfortunate, primarily because I was having such a great time with my new Vineyard vanity-plate friends. I met people unsuspectingly brought together by their appreciation, even reverence, for this Island. They are clever, convivial, and extremely nice. Their license plates can be as cryptic as a love poem. Some are funny, others are infused with hidden meaning, and all of them are conversation starters. They are badges of honor and reminders of the lure this Island holds. Back in 1901, New York became the first state to require cars to have license plates. Automobile owners made their own by imprinting their initials on leather or wood. These could arguably be called the first vanity plates. Two years later, Massachusetts started issuing state-manufactured numeric license plates, beginning with the number 1. Other states followed. Then in 1931, according to the website www.licenseplates.tv, Pennsylvania allowed car owners to create customized license plates. Since that time, highway reading, if that’s what you want to call it, has amused (WAS HIS on a Porsche convertible from Ontario), astounded (U R NEXT on a hearse), and encouraged (CHEK M on an Ohio plate promoting breast cancer awareness). Currently all over the United States, car owners have the option of buying personalized license plates – although each state has different requirements. In Massachusetts, for example, license plates must start with two letters and can have a maximum of six characters, and plates cannot alternate a letter with a number, like A1B2. In New York, plates can have up to eight characters, as well as spaces in between the letters; however, you need a minimum of one letter and cannot have six numbers followed by a letter. In North Carolina, vanity plates cannot exceed eight characters, yet can include symbols such as question marks and ampersands. North Carolina has a website where you can check to see if your desired moniker is available. As of this writing, ILOVEMV, MVROCKS, and MARTHASV are available in North Carolina. Sorry, MV BOUND is already taken. On any given steamy summer day, cars honoring Chilmark on their license plates can be found lined up in the Lucy Vincent Beach parking lot. These love letters to the town come from numerous states across the country and Canada. Once married and living in Washington, D.C., Jim, who passed away five years ago, liked to shower Ellie with gifts that reminded him of the Vineyard, like a necklace with a pendant in the shape of Martha’s Vineyard. He’d say, “I’m the one that gets to look at it when you wear it.” One year, for her birthday, he surprised her with a MVYARD license plate. “I said, ‘What did you do that for?’” recalls Ellie, noting that while she had certainly grown fond of the Island, she didn’t inhale it as Jim did. “I suppose it was because my car was the one we took to the Vineyard,” says Ellie. They got the SENGE plate, which is equally obscure to those not in the know, years later in honor of both their house, which they named Senge, and their West Highland terrier, also named Senge. Edgartown-born-and-raised Susan Brown projects an aura worthy of an MVLADY. She comes across as classy and down-to-earth with a playful sense of humor. For many years, Susan and her husband, Stuart, lived in Florida during the winter. When he wanted to start spending summers in Canada, Susan felt that she needed something to remind her of her roots. Her husband, who has since passed away, surprised her one Christmas with an MVLADY license plate. “A friend of mine, who is a cop and doesn’t know the Vineyard, asked me why I got a license plate that says motor vehicle lady,” Susan says with a laugh. She admits to trying to live up to the words on her plate: “I do drive more like a lady now.” There is one repercussion that came with having an MVLADY license plate. “My son refuses to drive my car,” chortles Susan. But is he man enough cart away brush in an MV LADY wheelbarrow? “Where are you going on your honeymoon?” asked a fellow jogger. “We don’t know yet,” responded Barry. The newlywed couple did indeed spend their honeymoon on the Vineyard. Two years later, they returned for a vacation with their one-year-old daughter. Two years after that, they started renting in Edgartown. Peggy and Rick Quagliaroli also demonstrate their longing for the Vineyard on their license plate. Seasonal Edgartown residents, Peggy and Rick spend their off-Island time living in Connecticut. The couple says before getting their own personalized plate, they shared a fascination in trying to decipher the meaning of license plates they saw. They decided to get theirs as a fiftieth birthday present to themselves. 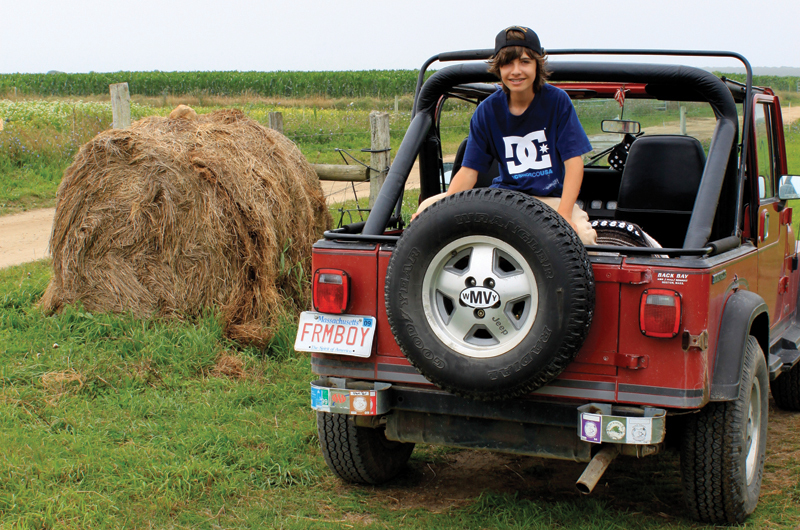 Kristi Jo McCabe has had personalized license plates since she started driving. Most notable was the KRISTI plate early on, and later the BOOTLEGG plate, a testimonial to her family’s colorful heritage. For the past decade, Kristi Jo, her husband Brian, and sons Kris and Kevin have memorialized their home away from home on their license plates. In 1998, they built a house in Edgartown near the Katama airfield. Five years later, the McCabes, whose primary residence is in Kingston, New York, bought an instrument-rated airplane, which decreased their commute time to an irresistible hour and fifteen minutes. “We love the Vineyard and love flying,” says Kristi. To recognize their dual passions, the McCabes, seen here with three cars and their airplane, are proud drivers of cars with a FLYMV license plate, a KMVY plate (KMVY are the call letters for the Martha’s Vineyard Airport), and a N98MV plate, which is also the aircraft registration number for their plane. The 98 refers to 1998, the year they built their house. The fun doesn’t end with the cars and plane, though – their boat’s registration is MA9800MV.